A home-and-home series between the Pittsburgh Penguins and New York Rangers will serve as a major point of interest in the NHL this week, and the two teams' meeting at Madison Square Garden on Wednesday will be the most expensive game of the week. The Maple Leafs, Bruins, Red Wings and Ducks will also host top-priced games when they welcome the Capitals, Flames,Canadiens and Blackhawks, respectively. Monday night will see the Penguins and Rangers convene at PPG Paints Arena in their first meeting of the season. It will be their game in Midtown Manhattan two days later that posts the highest ticket price average of the week, however. As it stands now the average resale price for Rangers tickets against the Penguins is now $361. If looking just to get past the gates at Madison Square Garden the cheapest tickets are listed from $145 each. On Saturday, the Maple Leafs will welcome the Capitals to Air Canada Centre in the second priciest game of the week. Maple Leafs tickets on TicketIQ currently average $261 and the get-in price is $79. The Leafs enter the week at a middling 8-7-3 on the year, but the 11-5-2 Capitals are bringing big ticket demand with them when they head north this weekend. TD Garden in Boston will be the site of the third most expensive game this week when the Bruins host the Flames on Friday night. With the Bruins working their way into the third spot in the Atlantic division at 11-7-0, the average resale price for Bruins vs. Flames tickets is now $227 and the cheapest tickets are $90 each. The Flames find themselves in the lower tier of the Pacific division as they enter the week at 8-12-1 on the season. The last-place Red Wings will appear on this week's top games list when they host the surging Canadiens at Joe Louis Arena on Saturday. 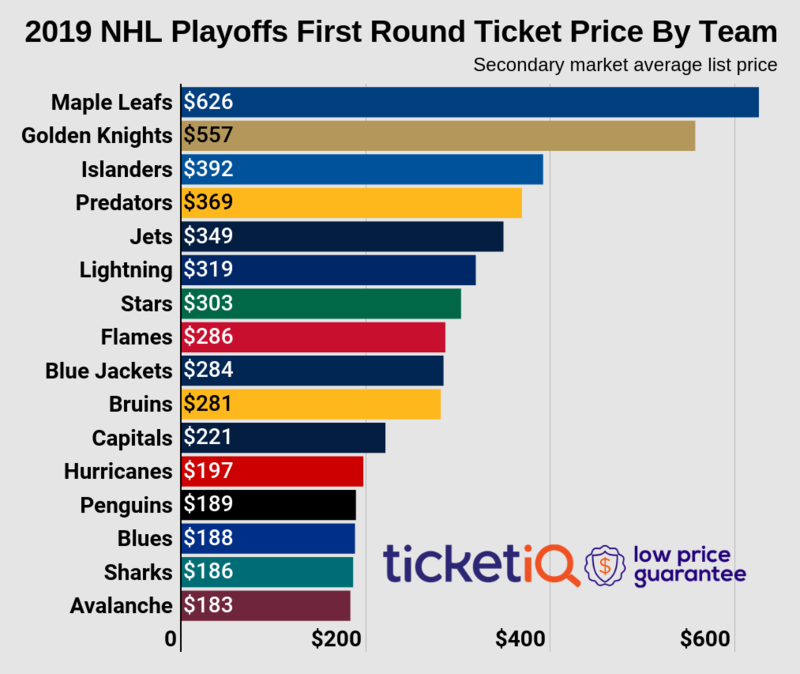 With the Canadiens bringing a league-best 14-3-2 record into the week with them, the average price for Red Wings tickets on the secondary market is now $217 and the get-in price starts from $116. Rounding out this week's top games list will be a Friday night affair between the Ducks and Blackhawks at Honda Center. With the Blackhawks skating to the top record in the Central division, the average price for Ducks vs. Blackhawks tickets is now $212 and the cheapest tickets can be found from $50 each. The Ducks currently sit in third place in the Pacific division at 9-7-3 on the season. For the best deals on NHL tickets this season, download the TicketIQ app. Our app is the only engagement-based loyalty program in the marketplace and helps fans save up to 10 percent on all IQ Certified listings. Download the TicketIQ app and start saving today!